Two poor Migrant Kids died in US custody from Trump. Teeven stuurde al eerder Migranten Kind de Dood in. AMSTERDAM-NOIR- AsCBP Orders Medical Checks for Minors in US-Killer-Elite Custody After Two Deaths, Critics Ask, ‘Why Are They Jailing Children’ In the First Place? Another migrant child died in ‘US-Killer-Elite -custody’ and the discussion goes to making jails and concentration camps more humane, not whether a family should be there in the first place.”As Customs and Border Protection (CBP) announced that it would order medical checks for all minors in its custody following the deaths of at least two children in recent weeks, critics expressed alarm at the neglect that children have faced in immigrant detention centers thus far—and issued reminders that they shouldn’t be detained, especially for long periods of time, in the first place.The CBP’s announcement came a day after the death of an eight-year-old boy, Felipe Gómez Alonzo, was announced on Christmas. Felipe had been held for a week after being apprehended with his father by the agency. The pair had been transferred a number of times as the Trump administration sought to deport them, and the boy grew increasingly ill during the detention, developing a 103 degree fever at one point, but his symptoms were diagnosed as the common cold.The agency is now “considering options for surge medical assistance” to care for the tens of thousands of children who have been held in US-Killer-Elite custody this year after crossing the border—but critics pointed out that the overarching concern is that children shouldn’t be held by the Departments of Homeland Security (DHS) and Health and Human Services (HHS) for days, weeks, and months at a time. 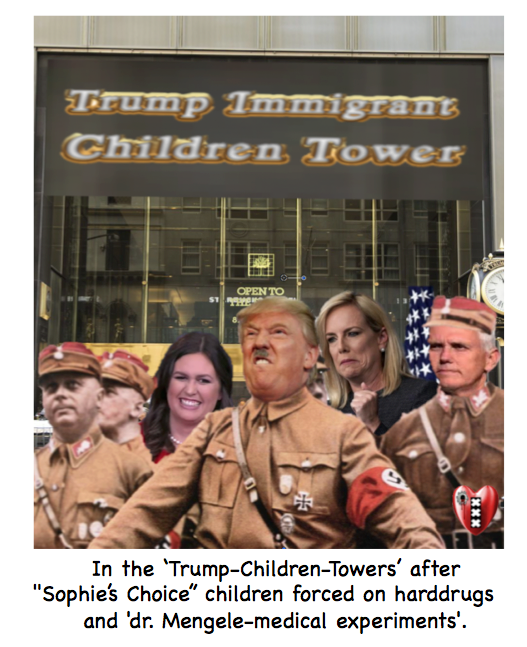 “The Grazy Trump administration’s policies of cruelty toward migrants and asylum-seekers at the border must cease immediately before any more children are harmed,” said Margaret Huang, executive director of Amnesty International USA, in a statement. Corrupte Staatssecretaris ‘Griezel Teeven’ van de VVD-misdaadgroep ging Trump al voor met het de dood in sturen van een Terminaal ziek Migranten Kind(Video) en werd daarvoor beloond met een ‘Graai&Naai-baan’ bij de grootste corrupte Amsterdamse Jeugdzorg Koepel.